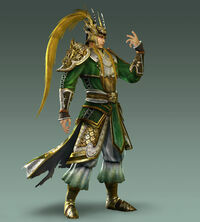 Ma Chao is well known for his goal of a land of justice. When his family is destroyed by Cao Cao, he often leads a resistance against their killer at Tong Gate. After the conflict, he wanders and eventually meets Liu Bei at Cheng Du. Though they are enemies during their struggle, he is impressed by their valiant spirit and capable warriors. He joins Shu from then on and participates in their Southern or Northern Campaigns. Ma Chao first appearance in the camp, his father, Ma Teng, held meeting about future to against Cao Cao.